The Lexington Extension plaque is used as additional name plaque for the Lexington Arch Plaque or for description and name plaques. The plaque is hand-cast from durable, rust-free recycled aluminum. 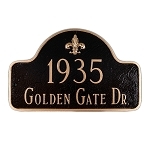 The Lexington Arch Extension plaque is ideal for one line signs for directions, information, or name plaques. Made in USA. - Personalization up to seventeen 1.25" characters. - Personalization up to seventeen 1.5" characters. The sign was exactly as stated and great quality. The sign is perfect and my experience with the company in assisting me was extraordinary. A: Yes. The height of the letters will be determined by the height of the plaque. So, Standard will have 1.25" H, Large 1.5" and Estate 2" H.
Here's one that holds up to five 3" characters.